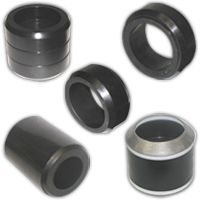 Baker Type Packer Elements & Valve Seals | Global EEE, Inc.
Baker-Type packer elements are crucial down-hole devices employed in practically all forms of well completions. They’re also critical in other situations where isolating the annulus is required — such as to aid in controlling production or conducting some form of treatment and/or injection. Ultimately, oilfield workers count on packer elements to perform well, especially when forming a reliable elastomeric seal with the liner wall or casing. With oil and gas explorations going deeper and further to meet today’s quotas, the need for well-made elastomeric products that can withstand high temperatures and adverse environmental conditions has never been greater. Fortunately, as an industry-leading supplier of elastomeric packer elements — including Baker-Type packer elements — Global Elastomeric Products, Inc. has the skills, facility and experience to manufacture practically any type of rubber molded product. Global Elastomeric Products makes many standard replacement packer elements as well as custom elements depending upon your specialized needs. Our Baker-Type packer elements come in a variety of versions and styles ranging in size from 4 1/2” all the way up to 9 5/8”. From lockset to high temperature elements, we offer a wide selection of Baker-Type packer elements to suit almost any oilfield application. When it comes to materials, our manufacturing experience speaks for itself. We’re skilled at producing products from traditional Nitrile and EPDM, as well as more specialized materials like Viton, FKM and Aflas. After producing high-quality elastomeric products for the oil and gas industry for more than 50 years, our American-made products are known for their ruggedness, performance and, above all, dependability. If there is an element that you need that is not on our site, give us a call at 661-831-5380. Our in-house design team, knowledgeable sales staff, quality products, and fair prices are just some of the reasons you should contact us today. We provide outstanding customer service and high-quality products, so you can be totally confident in choosing us as your packer element supplier. Because we’re an ISO 9001:2008-registered company, our strict quality control processes mean you get defect-free products on every order you place. E5RPR7555015C17 5 1/2" 13 - 15.5# 4.68 3.13 2.25 Baker Type "R"
E5RPR8155015E19 5 1/2 13 - 15.5# 4.68 3.13 2.65 Baker Type "R"
E5RPR4755023C 5 1/2" 15 - 23# 4.39 3.13 2.18 Baker Type "R"
E5RPR9470020E 7" 17 - 20# 6.12 4.115 2.57 Baker Type "R"
E5RPR4070029E 7" 20 - 29# 5.75 4.115 2.58 Baker Type "R"
E5RPR4170029C 7" 20 - 29# 5.75 4.115 2.36 Baker Type "R"
E5HB178EPE27 7" 5.95 4.10 3.68 7" X 4.00"
E5HB1700EPE28 7" 5.95 4.46 3.68 7" X 4.50"